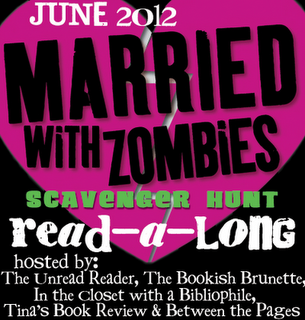 The Crazy Bookworm: Married with Zombies Scavenger Hunt Read-a-long: Week 1! Married with Zombies Scavenger Hunt Read-a-long: Week 1! My Gold(*cough* fake gold *cough*) Letter Opener! One of my favourite pair of heels. This heel could do some damage! *Shrugs* the closet thing to my was my empty oatmeal bowl. Maybe I could smash the bowl and use the shards to slice and dice! My Dog Grooming Shears that will definitely tear some Zombies up! Loving it so far, and having a blast with this scavenger hunt! Haha!I knew it. It totally looks like they are aiming for my nose! hahaha! I was going to say, be careful where you stick those things!